The ‘Going for Growth’ action plan by the Northern Ireland Executive to ‘grow’ the agri-food ‘industry’ has spawned a proposal for a huge factory pig farm three hundred metres from the village of Moys and a few miles from Lough Foyle, an environmentally sensitive World Heritage Site. While the pork is destined for export to China, in rural N Ireland the scheme will create just five new jobs and leave a legacy of bankrupt smaller scale farmers, smell from biodegrading pig faeces, cruelty to the cramped pigs, antibiotic-resistant diseases and contaminated waste. 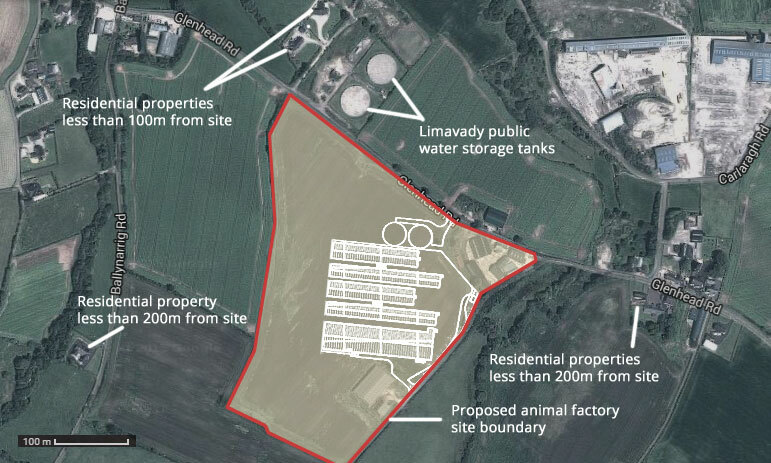 The proposed animal factory could intensively house up to 70,266 pigs, making it the biggest in the UK, and would produce annually 20,633 tons of slurry contaminated with heavy metals, ammonia and antibiotic-resistant bacteria. As in all animal factories, the pigs will be routinely dosed with antibiotics because their immune systems will be weakened by stress from overcrowding, early weaning, routine tail docking and lack of bedding. Recent figures from a report by the Alliance to Save Our Antibiotics show that the use of antibiotics in UK pigs is five times higher than in Denmark and the Netherlands, and twenty five times higher than in Sweden. A staggering 45% of antibiotics sold in the UK are given to mostly healthy animals to prevent them becoming sick in overcrowded and barren conditions. Needless to say the plan has come up against massive opposition from local residents. A local farmer who has lodged seventeen well-founded and thoroughly researched objections, one of which references 25 peer-reviewed science reports into the impacts of factory farms on human health. Irresponsible over-use of antibiotics produces resistant diseases, and still more alarmingly, creates genes that can transfer resistance to other pathogenic bacteria. The authorities are taking notice. As with similar plans for a factory farm near Foston, Derbyshire (that did not go ahead due to stringent environmental provisions imposed by the Environmental Agency), the developers are being inundated with requests for more and more information as described below. The Loughs Agency are asking how the decision was reached that the sensitive Special Areas of Conservation of the Rivers Roe and Faughan were suitable for spreading of toxic slurry. The Department of Agriculture, Environment and Rural Affairs has asked the applicants to demonstrate that the proposal will not exceed acceptable emissions of odour, ammonia, noise and dust. The Natural Environment Division of the N Ireland Environment Agency has objected because of the likely impact of the intensive units on the designated Sites of Special Scientific Interest. The development is within 7.5 miles of four SSSI sites, and the slurry spreading would take place within 7.5 miles of a further twelve SSSI sites, of which four are also Special Areas of Conservation under the Habitats Directive of the European Commission. While the public bodies and agencies wait for further information from the developers, local residents are keeping up the pressure, constantly highlighting the defects of intensive indoor animal factories. He submitted a report that air scrubbers in the sheds, heavily relied on in these plans, typically only reduce odour and ammonia emissions 33%. He also wrote asking the Northern Ireland Environment Agency whether the farms that will be taking thousands of pigs from the site to fatten will have Integrated Pollution Prevention and Control licenses, and has received no reply. An FOI request revealed that Northern Ireland Water had waved the plan through without having made an assessment of the likely impacts, and ignoring pollution convictions of similar factory farms in the area. For the local residents, fearful of their lives being ruined by toxic stench, noise, traffic and light pollution and a collapse in the value of their properties, this process is a bureaucratic nightmare. At a local meeting on 9 October residents whose health histories make them vulnerable were in tears as their concerns were brushed aside. The Public Health Agency denies receiving reports sent to them and is reducing the distance requiring a bioaerosol assessment from 250 metres to 100 metres. The anaerobic digester that makes electricity from the waste requires the same tonnage of maize silage to operate ‘efficiently’, which means 20,633 tons of maize per year, that could feed humans, has to be grown, converted to silage, transported to the site, and then disposed of after the methane has been released. Digestate from AD plants retains heavy metal contaminants and antibiotic-resistant bacteria and genes from the pig waste which would sicken people and animals even after direct injection into fields. The economic argument makes no sense either; similar pig factories are losing money, as are the livestock feed companies. It turns out that the viability depends on Renewables Obligation Certificates (ROC), a scheme in which generators of renewable energy receive payments. It is estimated that the Limavady pig factory would benefit from ROC payments of £1.4 m per year, which could be sourced from a tariff on electricity bills, including those of local residents who left the 9 October meeting in tears. In September 2016, Farms Not Factories, jointly with the Soil Association and Friends of the Earth, lodged an objection that quoted the well-reported risks to human health along with an opinion by Ben Compton QC, that people’s’ human rights could be infringed if the plan is approved. This would mean that, if people become sick, the Council could be held liable for damages. We can all help make animal factories a horror story of the past by only buying pork with a high welfare label. ‘Cheap meat’ is in fact really expensive as we are paying 3 times; once at the till, once through subsidies to clean up the pollution and once with our health as antibiotic resistance kills our loved ones. Turn your nose up at factory pork, – it’s as simple as that. If we don’t buy it, they won’t stock it. To spread the extra cost, eat less but better quality meat and thereby avoid diseases associated with the excess meat consumption like diabetes, heart disease and certain types of cancer. Please spread the message laid out in our short celebrity and chef led films, via social media. As more and more people become aware of the misery, dirt and disease in factory farms they will become conscientious consumers ie part of a growing movement to bring an end to the mistreatment of animals and irresponsible abuse of antibiotics – an industry that shames us all.